Ever since I was a kid growing up in New Jersey, I have been around some really good cheesecakes. I also had the fortune of my grandfather working for Kraft Foods, who is famous for many things including Philadelphia Brand Cream Cheese. 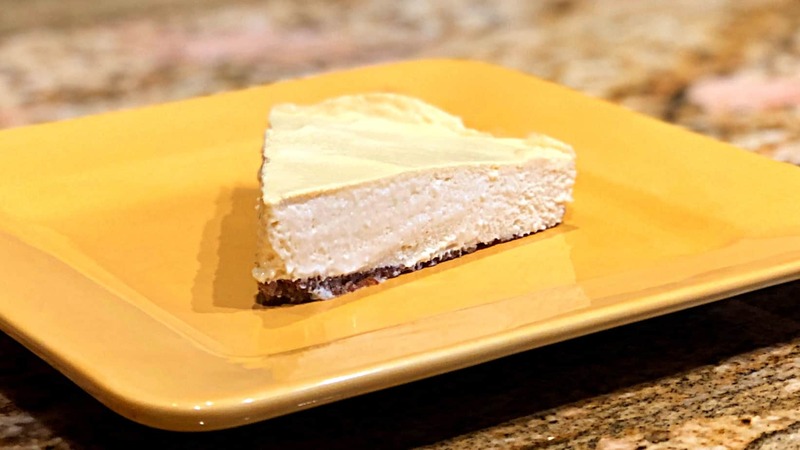 Somehow through the connections our family wound up with some really phenomenal cheesecake recipes, and I have even made some of my own award winning recipes in the past, before venturing into the Keto lifestyle. One of my biggest gripes about what most people call Cheesecake, is that the term appears to be thrown around and attached to anything that somehow resembles a cheesecake. We could quickly become unfriended if I were to be invited over expecting cheesecake for dessert, only to find out that what you call “cheesecake” is really one of those no-bake pudding disasters that’s been spread into a store-bought Keebler crust. Trust me, it’s happened, you don’t mess with cheesecake! 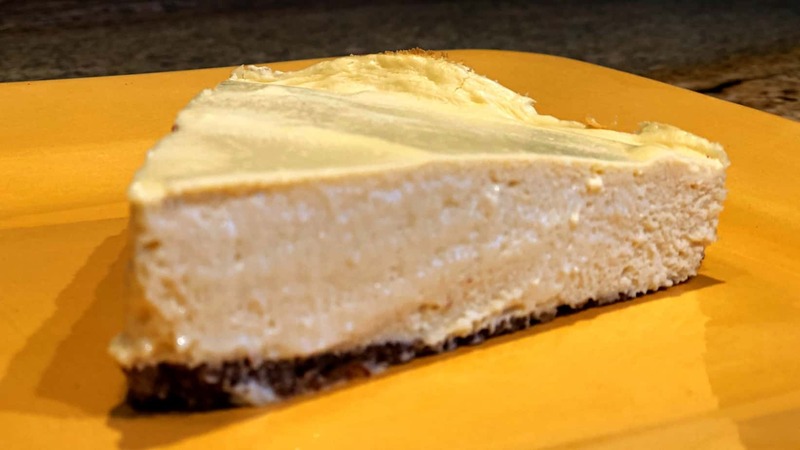 So when I wanted to adapt a low-carb and keto-friendly version of a cheesecake I found myself suddenly without the ability to use some of my very own secret weapons: Sweetened Condensed Milk, and White Chocolate. But have no need to fear, as the result here is still fabulous, even if it’s not going to go out there and win some State Fair competition. Even my mother-in-law was so impressed by it that she is now asking me all kinds of questions about my tasty dietary lifestyle. And did I mention how my kids gobbled it up and asked for another slice? Set the 2 bricks of Cream Cheese out on the counter at least 1 hour before you start this recipe so that they can properly soften. Preheat your oven to 350*F because it’s not going to take you long to whip up this cheesecake batter. In a medium glass bowl melt the 4 Tablespoons (half a stick) of butter, and then begin mixing in the 1 Cup of Almond Flour with a fork. At first it will seem like this may not be enough butter, but you will just need to quickly work with it. Trust me, you do not want to add more butter to the crust, even though you might feel tempted to. If you, do it might just come dripping out of your springform pan. Add in 1 Teaspoon Ground Cinnamon and 2 Tablespoons of Pyure Granulated Sweetener. You can also use Swerve, though they do not sweeten at the same ratios. Press the crust mixture into the bottom of your 9-inch springform pan and spread around evenly. This will produce a rather thin crust that should be about 1/8″ thick all around. Bake the crust for about 5 minutes in the oven at 350*F and then remove immediately and set on the counter. In a large bowl, begin to blend the Cream Cheese together with a hand mixer until evenly whipped. Add in the 2 Tablespoons of Vanilla Extract, 2 Eggs, 1/2 Cup Pyure Granulated Sweetener, and a dash of Sea Salt. Blend until evenly distributed. Spoon the cheesecake batter into the springform pan, and spread as evenly across the pan as you can. Place the cheesecake into the oven at 350*F on the middle rack and allow to cook for at least 20 minutes. Around that time begin to watch it carefully, as you want to make sure you cook the cheesecake long enough for the mixture to set, but not so long that you brown the top of the cheesecake. Remove from the oven when you believe it is done, and set on the counter to cool for about 20 minutes before placing in the refrigerator to cool for at least 4 hours (overnight preferably). Do not plastic wrap or cover the cheesecake with foil before putting in the fridge or else it will retain too much moisture on the top, but also do not add to a fridge that had exposed seafood or onions, as those flavors will seep into the cheesecake and ruin your day. Notes: It’s pretty hard to mess this cheesecake up. Feel free to add in some of your favorite keto-friendly ingredients like Lily’s Dark Chocolate. What about coconut flour & stevia sugar? Would you add more or less butter with the coconut flour? Thank you for the information on the sugar substitute… I’m going to make this tonight. How much more butter if using coconut flour? I use either xylitol or erythritol . Would it measure the same? The conversion says 1 cup of erythritol for 1/2 cup of pyure, but I only did 3/4 cups and it was plenty! Where did you find a conversion chart? How many carbs in this? do you have a nutritional breakdown? This looks wonderful! I, too, love a good cheesecake. I like to make a topping with strawberries and Swerve. I just eyeball the amounts and cook it on the stove for a few minutes; then let it cool and serve over the chilled cheesecake. I can’t wait to try yours. Do you have a print button? Am I just missing it? Thank you!! I need to add a dang print button. This one I use a 9 Inch. Also, I’m publishing a video on how to make this right now! The video looks like there is an additional crust around the edge of the pie/cake. Is there a step missing? And is there a decent replacement for the spring pan? Nope, no additional crust around the edges. The Cheesecake just browns a little more around there because of the pan. Thank you for catching that, Liz! Happy 4th!!! Sometimes takes 35 minutes or so. Depends on humidity, altitude, and all that. Also depends on how thick you make it. Mine are only about 1 inch thick with this recipe in the 9″ pan. Do you take the springform sides off before placing it in the refrigerator or after the 4 hrs? Is your Vanilla Extract particularly strong? Do you know the amount of Swerve instead of the Pyure? I want to make this now and it is all I have on hand! You would use 1 whole cup. Swerve is half as sweet as Pyure. I need to know the conversions.—- I have swerve and almond meal instead of what you have in the recipe. Could you give me the correct measurements for these products? Dear keto daily, I want to ask you, if i want to converse to gram, 12ons how many gram? Is it 2 teaspoons or 2 TABLESPOONS of vanilla? Thanks for pointing it out! Got it corrected to TBSP! You can probably make a great version of this with the “Flax Seed Egg” trick. Setting some Flax Seed Meal aside in a small bowl with water. Or Maybe Chia? Can xylitol be used instead? or does it have to be a powdered sweetener? I haven’t made it with liquid sweetener before, but I imagine that you COULD make it that way. Though since I haven’t used that, I couldn’t speak for the resulting texture of the finished product. Thank you so much for sharing your recipes. I’ll be making this over the weekend. I just found you this week. Yesterday I found the chicken video and recipe. I noticed some truly ugly people showing their lack of proper upbringing by making rude comments. If they think they can do better, well I’m seeing a lot of poor quality videos. Again thank you for your time and effort. I’m glad to find the help and grateful for your videos. I think they’re terrific. Besides, all computers have delete buttons. Keep up the great work. You’re filling a very much needed void. I was thinking of making these for indivisible cheesecake portions in cupcake liners. Do u see any problem with doing that ? That works out really well. Would probably just need to adjust the cooking time. Taste like the real thing! I am BEYOND excited to have found this! The children and hubby even loved it. My kids keep asking me to make it every day! I just made this tonight and it turned out AMAZING!!!! Thank you for the recipe! I’m due to make another one too! Double the amount of Splenda compared to the Pyure I used. Pyure is twice as sweet as sugar/splenda/etc. 🙂 Enjoy! I have swerve. How much would I use? Twice as much as the Pyure (since Swerve is half as sweet) But some people don’t like the flavor of Swerve in baked goods so it’s all up to what you like. I used 2 TBSP of vanilla & I did not like it. Taste is too strong takes away from the cheesecake. Anyone else have this happen too? I made this last night and having the same issue. I’m wondering if it should be teaspoon?? Cynthia, it must depend on the strength of the vanilla. I could personally stand to use even more than what I called for in the recipe based on the vanilla I use. Hi! Can you make this in a glass pie plate or does it need to be a spring form? Dorothy, you can make it in other dishes, you’ll just have to scoop it out like a normal pie if you do. I think with Cheesecakes, springform pans are just more traditional! I loaded these ingredients into My Fitness Pal, but my total carb count was 8 with 3 fiber. I used swerve, but it was listed as zero carbs. Sometimes MyFitnessPal greatly mis-calculates stuff. I have had it tell me one of my ingredients had like 36,000 calories in it when I changed the quantity. Often times products like swerve Splenda or any “zero calorie” “zero carb” product aren’t actually zero. The manufacturer can put 0 for anything that is less than 5 calories and can put 0 for anything less than 1 carb per serving. However let’s say it’s 0.9 carbs per tsp and you use 10 tsp you actually ate 9 carbs but the label will still say zero. So I generally trust myfitnesspal more as it doesn’t always have manufacturer inaccuracies. It’s always best to barcode scan the product too! (those rude people need to go away). I will be making these in individual portions. How can anyone get mad about Cheesecake?! When I saw this I was so excited I had to stop everything and bake it!! It turned out perfectly! So creamy and delicious and not to mention the perfect kind of sweet ????. I also added a Keto sour cream frosting not knowing how that would effect the cheesecake though it turned out delicious as well; however not nearly as scrumptious as the cheesecake itself!! ???? I am confused about the amount of cream cheese. US cream cheese is 16oz is one brick. This recipe says 2 bricks/16oz. If it’s 2 bricks it would be 32oz total. Weird, I live in the US and the bricks of Cream Cheese I have been buying my whole life are 8oz. Definitely use 16oz, on the chance that your local area only sells one pound bricks. Good question! Do you know how much more butter I should use if I use coconut flour? I haven’t made a coconut crust yet. I feel due to make another cheesecake though. I will make one with coconut flour crust and get back to you on that. Jennifer, I think that depends on HOW STRONG your Vanilla Extract is. No harm in putting in a little bit and then sampling with your finger to see what you think. I have only heard from a couple people that they thought it was too strong, most have said it was perfect. I may be missing it, but I’m not seeing the portion size for the nutritional value to be for. How many servings per cake? I made this yesterday but made a minor adjustment. I added 1/2 crushed pecans, 1/4 cup more almond flour and a table spoon more butter. Turned out really great. I made the cheesecake this weekend for my nieces birthday. She was worried with being on Keto that she wouldn’t have a cake. This was perfect! It is so easy to make and super delicious. I topped it with fresh strawberries which gave it a little extra natural sweetness. I am already planning to try this as a chocolate cheesecake by adding cocoa powder and a chocolate chip version. I will let you know how they turn out. Btw way, I omitted the cinnamon and added two tablespoons of lemon juice to the batter. That sounds yummy! Glad that she was able to enjoy a Birthday Cake! And Cheesecake makes the best birthday cakes IMO! I have a 6″ and 7″ springform pan, will those work? Yes, those size pans will work too. You’ll just have a little thicker cheesecake, and that’s cool too. Do you think a 5″ pan would work for half the recipe? Also, how long would you recommend baking for half? This looks fabulous, and I can’t wait to try it! That should. It will probably cook a bit quicker. Still bake it til it jiggles. Not sloshes, but jiggles. What other flour alternatives are there, if any? My wife is allergic to every type of tree nut, especially almonds. Also mildly allergic to coconuts. Which leaves me with no way of making so many of these recipes. Any help? Do u grease the pan first – I’ve never used a spring form pan before so I have absolutely no idea !!?? You certainly can. I don’t always do that though. But it’s not a bad idea. Cheesecake is really one of my favorites! This is awesome! I made one last week and at it again today! I added the Lily’s chips, too, and it was fab. Last time I used 1/2 cup Of swerve so this time I added a smidge more. Hoping it’s s a tad sweeter but the choc chips help offset it! Thanks again! Mmm, I hope it turns out great! I love cheesecake. I’ve made this with different extracts for different flavors and I was very happy with the pumpkin and the coffee ones. I have a question about the sweetener to be used. Can I use the MonkFruit sweetener like the one you use in your zucchini cake recipe? If so, then how would I adjust the amount to use in recipe? Yes, you can absolutely use the Monkfruit Sweetener too. Usually Pyure is twice as strong as sugar, and Monkfruit is equal to sugar so you would want to nearly double it depending on how sweet you like your cheesecakes. when the recipe calls for another sweetener other than sugar, how do you calculate the appropriate amount of monkfruit sweetener as a replacmement? Based on it’s conversion rate to sugar. Most substitutes will tell you on the container how they compare to sugar in measurements. The Pyure that I used measures TWICE as sweet as sugar, so I measure out half as much. Total carbs is 3 for what portion size? 1/10th of the Cheesecake. Full nutrition facts on the recipe show the full breakdown, including how many servings are yielded. I just made this tonight and it was fabulous!! Thank you so much! I was afraid of doing Keto for fear I’d have to give up sweets but this makes it all good! YUM!! I was reading the comments about the vanilla being to strong and I think the difference is real vanilla extracts vs. Artificial extracts . Real is way stronger. That could be the issue. And I always taste it before I bake it to make sure it’s not missing something or flavours are off. And I followed your recipe to a T, except I used Xylitol but the recommended amount and it was perfect! Thank you so much for creating these fabulous recipes!! There’s never enough cheesecake in this world! Do I need to spray the springform pan with a non-stick oil? I love pecan flour and would like to combine pecan flour with the almond flour. Should I add more butter? I’ve never seen Pecan Flour for sale. That sounds great though! I just found out I am pre-diabetic, and must cut down on carbs. It’s hard, but I think you might be my new best friend! Good luck to you Bonnie! This is usually a good way of eating to reduce your bodies resistance to insulin. Many people start eating this way to correct that type of issue, or in my case it was a fatty liver (which I believe is also a pre-diabetic symptom too). Help! The nutrition table says it is 3 carbs (minus 1 carb of fiber) and therefore a net 2 carbs per slice. But the almond flour alone is 12 grams of carbs, the 1/2 cup of pyure is 48 grams of carbs, now we are up to 60 grams of carbs (and 6 grams per serving) then add 2 tablespoons of vanilla extract is 3.2 carbs, and we haven’t counted the cinnamon, cream cheese, and eggs. I see 6.8 grams per serving. Are some carbs lost during the cooking process? The 48 Grams of Carbs listed in the Pyure are completely non-glycemic and have no caloric value or glycemic value. I’ve made this 2x and used vanilla extract 2tsps., I belief people may be using vanilla flavoring verses extract, because I believe 2 tblsps of extract would be awful strong. I used 2tsps, of extract, plus a splash of lemon juice, because I used swerve and the lemon takes some of the cooling affect swerve has!! Love this recipe, everyone in my family loved it even ones that don’t do ket o, my daughter added some blueberries, I’m going to do that next. Thank you for this awesome recipe!! Made this yesterday. Super quick and easy! Topped it with Smucker’s sugar free strawberry ice cream topping. Very good! Next time I will use xylitol to sweeten as Pyure has a bitter aftertaste to me. Otherwise this recipe is a definite keeper! How many carbs in 1/2 cup of Pyure? I love sour cream, but I never put it in cheesecake it’s just one of those combos I don’t personally have a taste for. I thought this recipe was easy to follow, thank you for making directions clear. I did half almond flour and half pecan, I pulsed whole pecans until they were crust like. Next time I will do full cup Almond and add half cup pecan. I like a think crust so I may just double crust recipe. I also used Monksugar, 1/2 cup, the batter seemed sweet enough. The batter seemed a bit runny before baking, I am not sure why, but it seemed to bake ok. It is sitting on the counter teasing me as I type. It smells and looks amazing. I can not wait until tomorrow. Thanks again. Is the vanilla extract listed in the recipe pure vanilla extract or imitation vanilla? I see a lot of comments that it’s too vanilla-y, so I’m wondering if that may be why, since pure vanilla is much stronger than imitation. Making this for my birthday tomorrow, so I’ll probably use just 1T and see how it goes. This comment above says 1/10th of the cheesecake is serving size, but can’t see it in the nutritional value and that pic sure looks better than that… are we certain on this serving size? Nutrition Facts are calculated off of 1/10th of the Cheesecake, not off of the slice in the photo. Question — is your serving size based on i slice of cheese cake or is the label based on the whole cake? That Nutrition Label is based on a slice of cheesecake, and lists the amount of servings in the entire cheesecake. Just like a traditional Nutrition Label would tell you from store-bought items. I’ve tried many recipes and this is the best dessert so far. Thank you for posting it’s expensive trying things that don’t work. It was great! Simply amazing! You are our hero. Thank you for this recipe. Thanks for the encouragement Joni! Is it pure vanilla extract or imitation vanilla? Love this cheesecake! I’m wanting to add pumpkin to it but have absolutely no idea how much to add, if i subtract anything when i add it.. any idea?? I was also wondering about the pumpkin to add to this cheesecake. I will have to go look. Thanks so much! Hi, i only have almond meal, the flour is hard to get here in Australia. Will that work? Almond meal is sometimes coarser ground and sometimes just the name applied to unblanched almond flour. The finer the better so you could always put it in a food processor to make it finer if in doubt. I also add a sour cream topping made with carob mixed with stevia. Put it on there after the pie has been in the fridge for 4 hours. Any ideas on how to make this a chocolate cheesecake? Simple and superb recipe. Can’t wait to give it a try!! Can I do it in microwave or stove top?? Any idea? I have never tried making a cheesecake in a microwave or on the stove. I have loaded this recipe in the Lose It app and the carb count is 13.7 grams per serving. How are you coming up with 3 grams?? Most of those apps do not account for the fact that the “grams of carbs” that are in Pyure are from Stevia and Erythritol, which have no calories and no effect on the blood sugar. They are not actual carbs. Made this today for my husband who loves cheesecake. It’s our 25 anniversary so I wanted to make him something special that would satisfy his sweet tooth that was also fancy. He gave it 2 thumbs up! 🙂 Very cool to hear! OMG so yum! I made these using cupcake tins. It made 18 (scant TBSP of crust and scant 1/4 cup batter). I used liners and baked for 20 minutes. I’m addition to the vanilla I added some almond extract and topped each one with some slivered almonds. Can i use monk fruit from lakanto ? How much? You can use the monkfruit if you would like to. Pyure is twice as sweet as Lakanto, so you would need to use twice as much of the Lakanto granular monkfruit. If you used the powdered Monkfruit from Lakanto you will use the same amount as I used of Pyure. I recommend the powdered version if you use the monkfruit so that the cheesecake is not gritty after it is chilled. I’m new to keto so which would be best to use, I have erythritol and swerve also what measurements would I use? Swerve is Erythritol with Stevia extract. The Pyure is TWICE as sweet as sugar, so look on the bags of your sweeteners and compare to that to get the exact amounts you will need. I personally don’t like the taste of the swerve in the cheesecake, so I would probably go with just the Erythritol. You can, it’s just a lot easier to get cheesecakes out of a springform pan in their entirety. I literally just pulled this out of the oven and we it was sweet SUCCESS!!! It even looks so pretty I wish I could attach the pictures I took of it. Made this recipe on Thanksgiving and it did not disappoint. I know this is probably a guy thing but the only thing I would change is doubling the filling. Mine shrunk down to about one and a half inches when cooled but all in all a great contender to any cheese cake that I’ve ever had. My macros came up as 6 net carbs, but I added 1 cup of Lilly’s chocolate chips. Also, I didn’t use any cinnamon, I don’t like it. So I’ve been making this cheesecake recipe every week for about 2 months. Just as a special dessert after dinner. Today while making it I thought to myself the ingredients sound somewhat familiar to some of the keto ice cream recipies. So in the freezer some of it went az md wow if you want a cool dessert give it a try.